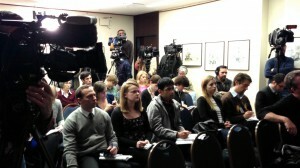 Minutes after President Obama’s major address on NSA surveillance on Friday, Jan. 17, the Institute for Public Accuracy held a news conference with noted NSA veterans and whistleblowers. Bill Binney (right) is former technical director of the NSA’s World Geopolitical and Military Analysis Reporting Group and co-founder of the SIGINT [Signals intelligence] Automation Research Center. Russ Tice (standing) is former National Security Agency analyst and a source for the New York Times’ pieces published in 2005 about NSA surveillance. J. Kirk Wiebe (seated next to Binney) is former senior analyst with the NSA’s SIGINT Automation Research Center. 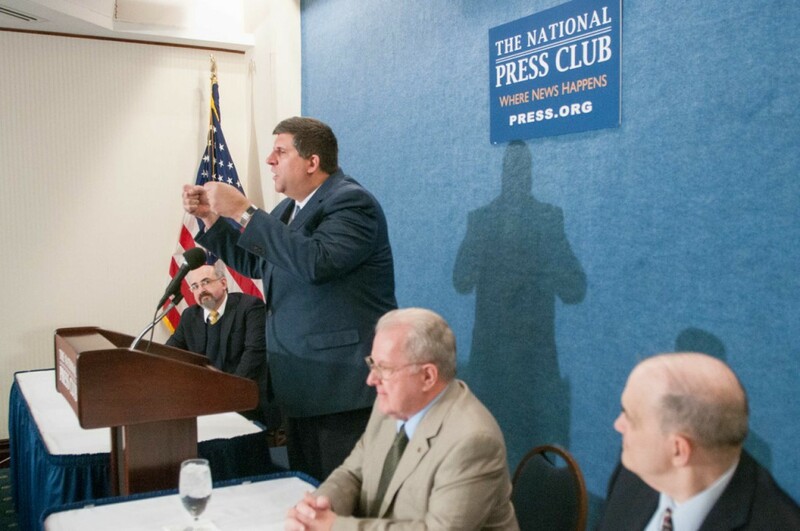 (Wiebe and Binney were featured on an IPA news release “Obama NSA Speech: Intelligence Whistleblowers Available for Interviews.”) Sam Husseini (left), IPA’s communications director, moderated the event. Fifty years after Lyndon B. Johnson made it the centerpiece of his first State of the Union address on January 8, 1964, the War on Poverty remains one of the most embattled—and least understood—of Great Society initiatives. It’s an anniversary worth celebrating, despite historical memory distorted by decades of partisan attack, both for the commitments and priorities it reflected, and for the insights it offers into the political challenges of fighting inequality today. The War on Poverty was still very much in the planning stages when LBJ made his historic pledge, though its broadest outlines were sketched out in the speech and in the 1964 Council of Economic Advisers Report: a fast-growing, full employment economy; an all-out “assault” on discrimination; investments in education, job training, and health care; and locally organized programs of community action, planned with what would only later be added as a legislative mandate for “maximum feasible participation” of the poor. Opportunity was the initiative’s keyword, enshrined in the enabling legislation, and the newly-created agency, the Office of Economic Opportunity, that became its administrative home.